Please answer each question clearly and completely. Type or print in ink. Read carefully and follow all directions. 10. Entry into United Nations service might require assignment and travel to any area of the world in which the United Nations might have responsibilities. Have you any disabilities, which might limit your prospective field of work or your ability to engage in air travel? 16. Have you taken up legal permanent residence status in any country other than that of your nationality? 17. Have you taken any legal steps towards changing your present nationality? 18. Are any of your relatives employed by a public international organization? 19. What is your preferred field of work? 21. Have you previously submitted an application for employment with U.N.? 24. EDUCATIONAL. Give full details - N.B. Please give exact titles of degrees in original language. A. UNIVERSITY OR EQUIVALENT	Please do not translate or equate to other degrees. · Economic Efficiency of Alternative (non-oil) Resources in Petrochemical Production. 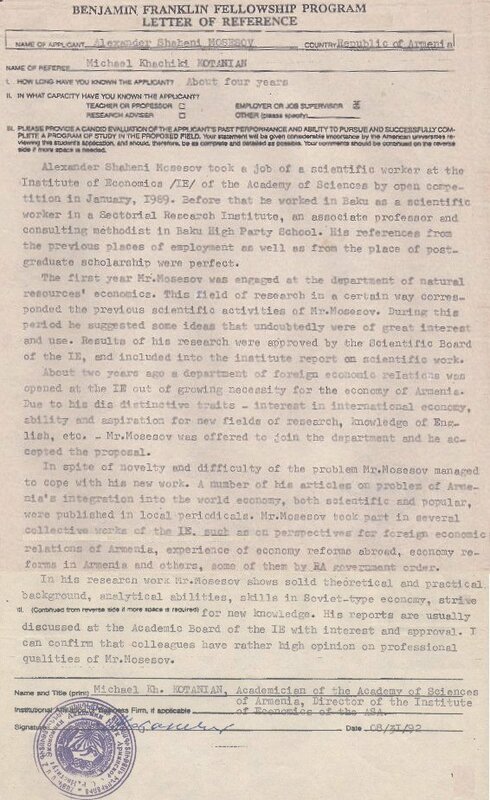 Candidate of Sciences Dissertation, USSR Academy of Sciences, Moscow, USSR, 1985. 27. EMPLOYMENT RECORD: Starting with your present post, list in reverse order every employment you have had. Use a separate block for each post. Include also service in the armed forces and note any period during which you were not gainfully employed. If you need more space, attach additional pages of the same size. Give both gross and net salaries per annum for your last or present post. 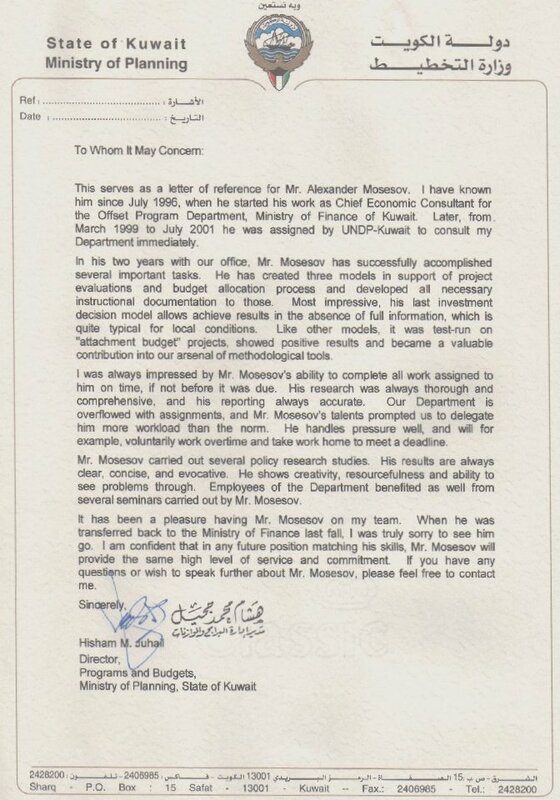 Consulted Counter-Trade Offset Program Department (OPD), Ministry of Finance of Kuwait. 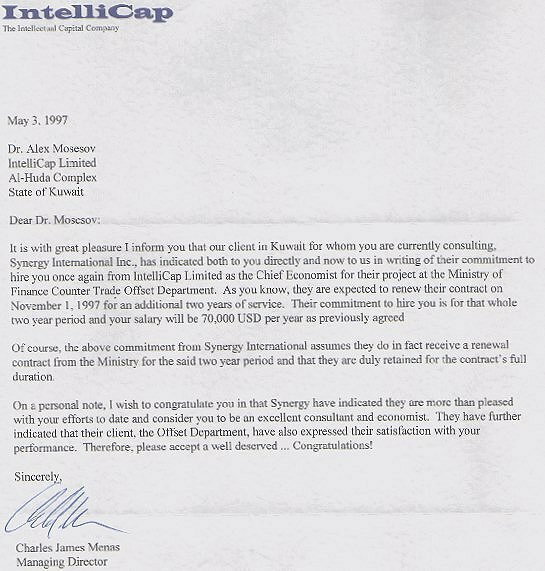 Provided economic, social and financial evaluations of international Offset Business Ventures, as well as economic/econometric estimations of their impacts on the economy of Kuwait. Designed and introduced several models in support of these functions. 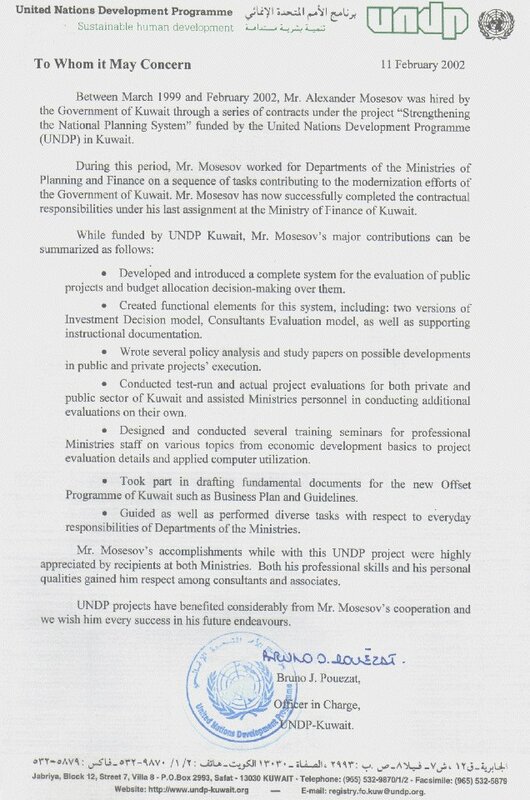 One of them, the Evaluation Model, is now a standard tool in the everyday practice of the Offset Program of Kuwait. Provided OPD with reports and recommendations on policy issues. Developed and conducted seminars for professional staff members. Joined US AID funded Universities’ Partnership project. Consulted joint seminars and workshops on development of private sector in various areas of Russian agricultural business. Lectured principles of macro- and microeconomics to students and adult professionals. Introduced several curriculum revisions and some new approaches to teaching. 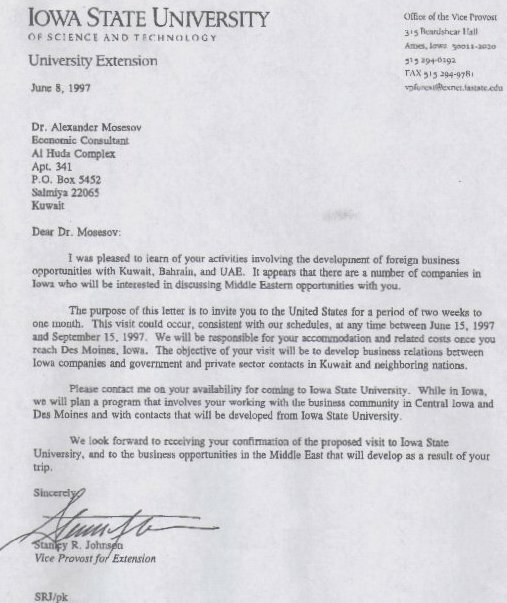 Was competitively selected to visit the U.S. academia as an Edmund Muskie Fellow (IREX, USA). Took some graduate classes towards M.S. degree in Economics. 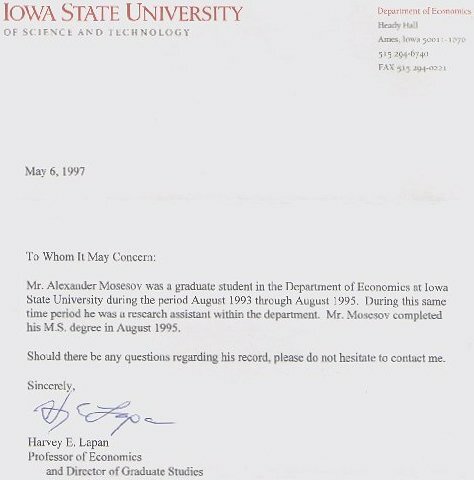 Conducted independent research for the Center of Agricultural and Rural Development, Department of Economics, Iowa State University. Focused on application of gravity models towards inter-republic trade in the countries of the former Soviet Union. Lectured undergraduate students on principles of economics and international trade. 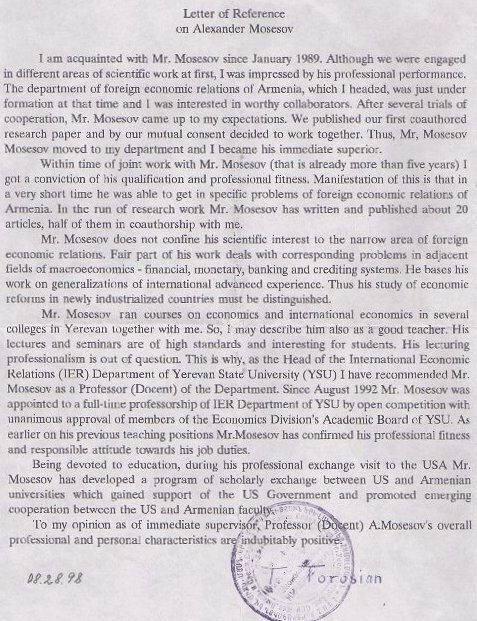 Conducted research on foreign economic relations of Armenia. Research: Armenia’s market transition - new financial, fiscal, and foreign trade systems, natural resources. 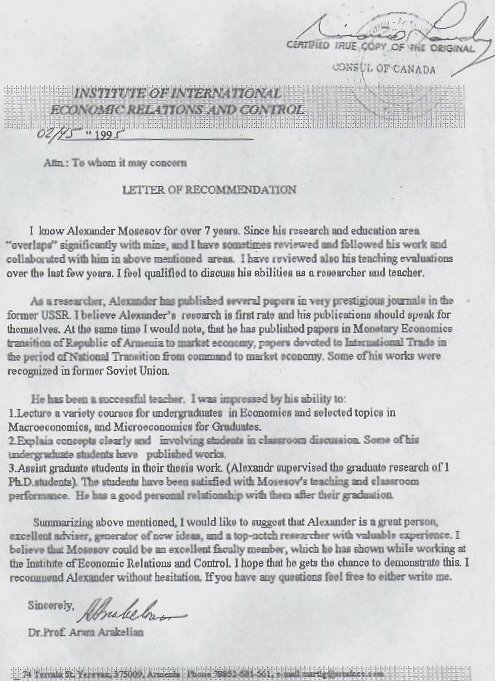 Developed curriculum and teaching materials, lectured principles of Soviet economy, research on natural resources valuation under market transition. 28. HAVE YOU ANY OBJECTIONS TO OUR MAKING INQUIRIES OF YOUR PRESENT EMPLOYER? 29. ARE YOU NOW, OR HAVE TO EVER BEEN, A PERMANENT CIVIL SERVANT IN YOUR GOVERNMENT’S EMPLOY? 30. REFERENCES: List three persons, not related to you, who are familiar with your character and qualifications. Do not repeat names of supervisors listed under item 27. No relatives employed by a public international organization. No restrictions that should be taken into account in connection with my employment with the United Nations. HAVE YOUR EVER BEEN ARRESTED, INDICTED, OR SUMMONED INTO COURT AS A DEFENDANT IN A CRIMINAL PROCEEDING, OR CONVICTED, FINED OR IMPRISONED FOR THE VIOLATION OF ANY LAW ? OTHER AGENCIES OF THE UNITED NATIONS SYSTEM MAY BE INTERESTED IN OUR APPLICANTS. DO YOU HAVE ANY OBJECTION TO YOUR PERSONAL HISTORY FORM BEING MADE AVAILABLE TO THEM ? I certify that the statements made by me in answer to the foregoing questions are true, complete and correct to the best of my knowledge and belief. 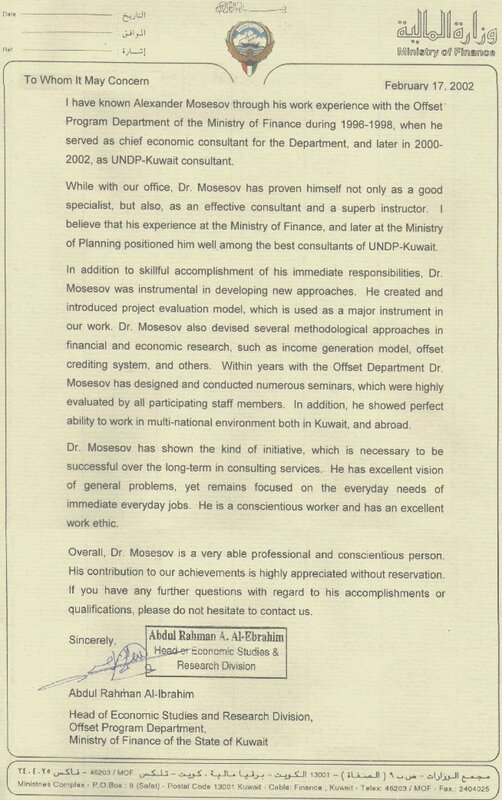 I understand that any misrepresentation or material omission made on a Personal History form or other document requested by the Organization renders a staff member of the United Nations liable to termination or dismissal. N.B. You will be requested to supply documentary evidence, which supports the statements you have made above. 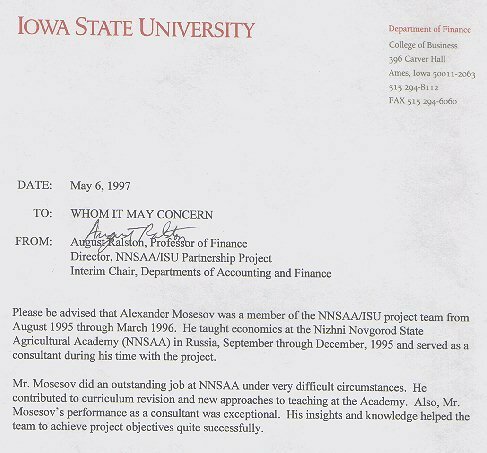 Do not, however, send any documentary evidence until you have been asked to do so by the Organization and, in any event, do not submit the original texts of references or testimonials unless they have been obtained for the sole use of the Organization.